We're proud of the work we do, as well as the work it took to get here. We've established relationships with various government and private-sector organizations to ensure that we're meeting (and exceeding) the quality standards for our industry. Reliability Screening Solutions Inc. (RSSI) is accredited by the Canadian Criminal Real Time Identification Services (CCRTIS) branch of the Royal Canadian Mounted Police (RCMP) to provide fingerprint-based Criminal History Checks. CCRTIS has partnered with Public Works and Government Services Canada (PWGSC), Canadian Industrial Security Directorate, to develop a new process for accrediting private companies to take fingerprints for non-criminal purposes. RSSI is one of the first agencies in Canada to successfully complete this new accreditation process. CCRTIS Accreditation – Albert St. Accreditation is a process whereby the business and the individuals in that business who handle sensitive or private information are screened to ensure the safety of the public. These background checks include fingerprint-based criminal history, credit checks and address history screening for individuals. In addition, the organization and its directors, officers and controlling shareholders are reviewed in detail. The physical business also undergoes a security audit to ensure appropriate document and information handling procedures are in place. 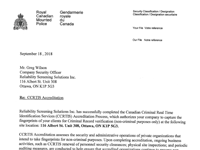 Reliability Screening Solutions Inc. has been accredited by CCRTIS and will continue to undergo periodic compliance reviews by CCRTIS and PWGSC. CCRTIS accreditation procedures assess the security and administrative operations of private fingerprinting companies that intend to take fingerprints for civil and/or refugee purposes and submit the fingerprints as live electronic transactions to the national repository for criminal record verification. Certification is a process whereby the software and systems used in the fingerprint submission process are tested for compliance with international and RCMP specifications to ensure reproducibility of results. Both the systems and the components are certified in end-to-end testing. Fingerprint quality in both the capturing and printing processes is very important, as is the compliance of individual data items and reference numbers. All Reliability Screening Solutions Inc. systems and component have met or exceeded the standards as set by CCRTIS. CCRTIS certification processes ensure that contributing agencies are capable of electronically submitting National Institute of Standards and Technology (NIST) compliant transactions to the national repository. The process enables agencies to perform end-to-end verification within a formal certification environment prior to becoming operational. All Reliability Screening Solutions Inc. personnel have undergone personnel screening, including fingerprint background checks and credit checks, and have been issued security clearances under CCRTIS. Reliability Screening Solutions Inc. services are supported by industry-leading software and systems.